Authorities have also introduced stricter rules on how much people send abroad using wire transfer services. 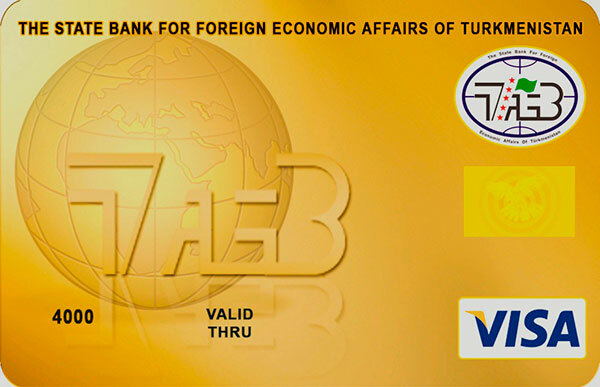 A mock-up of the Visa card offered by State Foreign Economic Bank of Turkmenistan. With the available pool of foreign currency dwindling to ever smaller amounts in Turkmenistan, banks have reportedly suspended the operations of locally issued Visa cards, both inside and outside the country. Particularly badly hit are young people studying abroad, who are largely unable to receive funding from relatives in Turkmenistan as a result. RFE/RL’s Turkmenistan service, Radio Azatlyk, reported on February 25 that restrictions on the use of Visa cards have been in place since January and have now been further intensified. This move has been on the horizon for several weeks already. Reuters news agency reported in December that the government was instituting a fresh clampdown to stop the outflow of money. As it became ever more difficult to buy foreign currency locally, many people began transferring money to their bank card accounts, converting them to dollars at the rate 3.5 manat to the greenback, and then getting the funds cashed out overseas. “But cashiers at two Turkmen state banks have told a Reuters correspondent this week that the monthly limit for such transfers have been halved, to $500,” the news agency reported on December 14. A month earlier, Turkmen banks had cut the daily limit for card withdrawals to $50 and the maximum amount available for payment to $200. All these options would seem, if the Radio Azatlyk reports are accurate, to now be off the table. The situation with the manat is desperate. Although the official exchange rate remains fixed firmly at around 3.5 manat to the dollar, the black market dollar exchange rate is a moving feast. In December, Reuters reported that it was just under 10 manat, but earlier this month, one foreign-based, dissident-run news website cited cases of dollars selling for as much as 14.2 manat. The government obviously does not openly acknowledge the issue, but occasional pronouncements by President Gurbanguly Berdymukhamedov make it clear this is a pressing worry. Baku-based Trend news agency cited Berdymukhamedov as saying on February 3, although not with any sense of obvious urgency, that “work must be carried out to increase the amount of foreign currency earnings.” The president then went on to reprise the line about the urgent need to diversify the economy and boost the role of the private sector — a goal that remains mystifyingly unfulfilled despite Berdymukhamedov’s visionary policy of simply demanding it over and over (and over) again. The restrictions are piling misery upon indignity. With the Visa option now foreclosed, the pressure is now being thrown back to the traditional option of wiring money. A correspondent for Radio Azatlyk said that as of February 22, people had been able to transfer sums of up to $300 to relatives abroad through services like MoneyGram and Western Union. Only one monthly transfer is normally permissible. The Chronicles of Turkmenistan news website offered figures, reporting on February 23 that Western Union has reduced its per transfer-limit to $50, from $200 previously. Huge lines have formed outside banks as a result. “For example, there were about 400-500 people outside a branch of Senagat Bank on Turkmenbashi Shayoli street. People are processed very slowly,” said one Ashgabat resident, Amanmurat Bugayev, cited by Radio Azatlyk. Sending money via wire transfer companies is a multi-step process. People first have to obtain an authorization slip from the Central Bank with which they can then go to a retail bank to use the services of Western Union or MoneyGram. Yet another option, transferring cash through electronic payment systems like PayPal, Kiwi, Webmoney and Yandex.Money, have also been halted by the State Foreign Economic Bank of Turkmenistan this week, Radio Azatlyk reported.